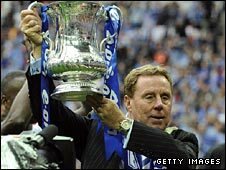 There have been many better FA Cup finals than Portsmouth's victory over Cardiff but few more popular Wembley winners than Harry Redknapp. The charismatic Pompey boss has finally struck gold after toiling for 44 years as player and manager for scant reward. And his on-field success comes after a season in which he has endured more off-field problems than all his previous campaigns put together. Redknapp's house was raided last November by police investigating allegations of corruption in football, an experience which clearly still rankles with him. Then last month, his wife Sandra's twin sister Pat, wife of Frank Lampard Snr and mother of Chelsea's Frank Jr, died of pneumonia. Through adversity, however, comes triumph, and Redknapp, who had to deny reports he was planning to walk away from football in the build-up to the final, has clearly earned his "glory" - which is how he referred to Portsmouth's win. "It's been a difficult year but football-wise it has been fantastic," he told BBC Sport. "I never felt like packing it in, and I never felt sorry for myself - I never do. "You go through these things in life - it has not been a very good few weeks for me but I have had a very good day." Things could have been very different had Redknapp accepted an offer to take charge at Newcastle in January, but his reward for staying at Pompey has been to end the club's 69-year trophy drought and also secure the first major silverware of his managerial career. Now Redknapp has a place in Europe - in next season's Uefa Cup - to look forward to but his immediate plans after the final whistle were a lot closer to his Dorset home. "How am I going to celebrate? Well if I can sneak away and get my wife in the car I will head back to Bournemouth, see if my two dogs are alright and then go to a little Italian restaurant around the corner," he explained. "Then I will get up in the morning and look forward to getting on the bus and having a ride around Portsmouth to see all the supporters. That's my plan." The response was typical of Redknapp, 61, who has always been straight out of football's old school, having grown up watching Arsenal from the Highbury terraces in the 1950s. Tradition ranks high among his priorities, so it is perhaps no surprise that he puts his family and Pompey's fans first despite his obvious personal pride at the final whistle on Saturday. He appeared reluctant to hand over the famous old trophy once he finally got his hands on it but then tried to claim winning it was not his greatest achievement. That, apparently, is keeping Pompey in the Premier League when he returned to the club in December 2005. They are both chapters in the same unlikely story, however, as is the manner in which he has won over the Portsmouth faithful. They vilified him when he took charge at Southampton soon after ending his first spell at Fratton Park in 2004 and hardly welcomed him back with open arms 12 months later - for a while he was the most unpopular man on the South Coast if you believed the graffiti that was prevalent in the area. 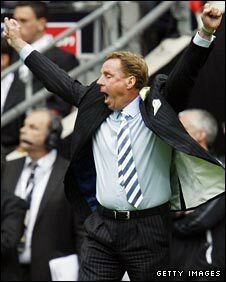 That is all forgotten now though, judging by the chants of 'There's only one Harry Redknapp' that rang out round Wembley in the closing minutes against the Bluebirds. His players love him too, with match-winner Kanu telling BBC Sport: "Everybody wants to play under him - he is somebody special." The Nigerian has played under Louis van Gaal at Ajax and Arsene Wenger at Arsenal but, for him, there is nobody quite like Redknapp. "Nobody knows how he does it but he brings the best out of the players," Kanu added. "He tells you what you want to hear, he tries to talk you up, he tries to give you the belief and you go there to do the work for him. "He knows what I can do. Before the game he told me 'King, listen to me, do your magic - you are the best'. When you hear that from your coach, you want to do something for him." It is not just because of his pre-match team-talk that Redknapp can take some credit for his side's victory either - he was on John Utaka's back for most of the first half, telling the winger to stay out wide and run at the Cardiff defence. When Utaka finally got the message, he ran down the right and sent over a cross that was fumbled by Peter Enckelman, allowing Kanu to pounce for the only goal of the game. It is only fitting that Redknapp's long-awaited success has come in the FA Cup. It is, after all, the competition in which he made his name as a manager. In 1984, his Bournemouth side beat holders Manchester United in the third round at Dean Court in a result that remains one of the biggest shocks in Cup history. Pompey's run to Wembley saw them beat United again, this time at Old Trafford in the quarter-final. Since that stage they have been the favourites, rather than the underdogs, firstly against West Brom in the semi-final, then against Cardiff. They came through both tests and Redknapp has become the first English manager since Everton's Joe Royle 13 years ago to win the Cup, while his Portsmouth side have broken the monopoly of the 'Big Four' - Arsenal, Chelsea, Liverpool and United - that has lasted just as long in the competition. It is an achievement that should not be underestimated and should, at last, earn him the credit he deserves.